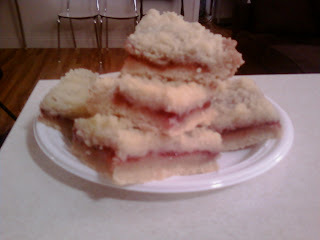 Strawberry Pie Bars - strawberries, pie, cookies - without the hassle of a pie crust. This recipe has three parts: the crust, the filling and the streusel topping. 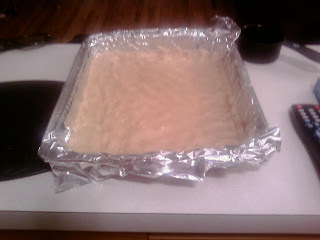 I lined the pan with foil before pressing the crust in, for easy lifting out and clean up. This is the kind of recipe where you could use any filling - in fact the original called for an apple pie filling, but you could use jam, berries, even chocolate if you're so inclined. 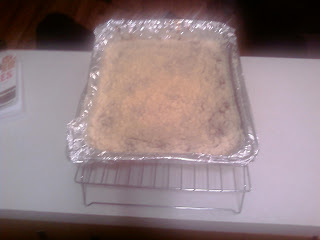 Then sprinkle the streusel evenly on top before sticking it in the oven. This smells gooood when its baking. It's difficult for me to wait for it to come out. But I managed. Leave it to cool entirely before cutting into bars. 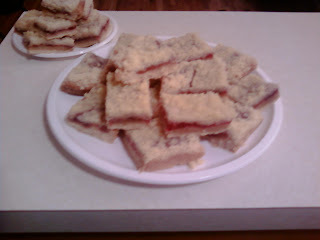 You can make these any size you want - from strawberry pie bites or big slabs. Tip of the Day: Leave butter out for an hour when recipes call for softened butter, or hasten the process in the microwave - but be careful, it's a fine line between softened and melted. For cold butter, use it straight out of the fridge. Crust: cream butter and sugar together until well mixed. Add egg and mix to combine. Press into the bottom of a greased 9x13" pan, and 1/4 inch up the side. 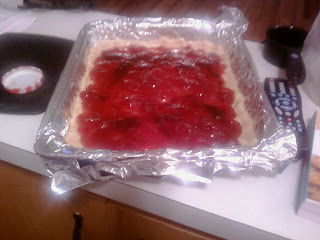 Spread the jam filling evenly over the crust, stopping 1/2 inch from the edge. Streusel: Combine sugar, flour and salt in a bowl. Cut in the butter until mix is crumbly. Bake at 350F for 35 minutes until golden brown. Can this be frozen if I make tom. and I don't need till shabbos lunch? Yes, should be fine frozen in an airtight container. Good for breakfast. 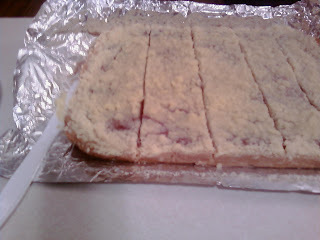 I used boysenberry jam, frozen raspberries and sliced fresh strawberries, then added the crumble (the dough for topping, I used the same ingredients, added oats, and made it more of a cobbler like consistency)...It was enough to feed maybe 10 people. I had four over, sent some home with the young couple, and ate the rest for breakfast. Thank you for the recipe.